In our quest to look at capacity issues and opportunities in Sussex we come to part 5 and are still only as far south as Clapham Junction – and we still haven’t yet looked at London Bridge in this context. Within our look at Victoria it appeared that the terminal station was not a major problem. At least with our look at Clapham Junction we are getting to the heart of one of the major problems that prevents a better train service to Sussex. It is worth noting here that we do not look exclusively at Clapham Junction from the perspective of the Brighton Line. The problem of the station being generally fit for purpose for the number of passengers using it is also important to consider. For this we have to look at the whole station and whilst we are here we might as well also look at other enhancements taking place. Certain stations are interesting thanks to their singularity. Until recently this could probably have been said of Clapham Junction. It has 17 platforms which is far more than almost any other station that, at the end of the day, is just a suburban station. Currently only Stratford is really comparable, although maybe one day Old Oak Common will also be in the same category. Clapham Junction station is in two parts – one hesitates to call them halves given that one is much bigger than the other. There is the western side with platforms 1-6. Platforms 1 and 2 are for London Overground services and platforms 3-6 serve the Windsor lines into Waterloo run by South West Trains. On the eastern side are platforms 7-11 for South West Trains Waterloo services to and from Wimbledon and beyond, platforms 12-15 for Southern services into Victoria and 16 and 17 for Southern services heading to Shepherds Bush and beyond via the West London Line. A diagram of the station layout can be found here. As can be seen from the picture below, the area lying between the tracks which separates the two parts of the station is quite enormous and is used to stable trains – including an old slam-door set. There is space which could be reallocated to build additional platforms, which would perhaps help overcome some of the issues at Clapham Junction. The trouble is, as Carto Metro shows, the price of losing essential access to the very useful stabling area is probably too high. Clapham Junction is claimed to be the busiest station in Britain. Of course that depends on how you measure it. If you stick to National Rail services and include services which, or passengers who, simply pass through it then it is probably true. As Diamond Geezer’s wonderful collation of rail usage statistics shows though, in terms of passengers entering or leaving the station Clapham Junction is no longer the busiest National Rail station that isn’t a London terminus. That crown was lost this year to Stratford. Of course, what makes Clapham Junction really busy is the number of people changing trains there – people who never venture outside the station and probably have little geographic idea of where Clapham Junction station is. The figures over the last ten years show (with one exception) that the number changing trains there is almost identical (within a few percentage points) of the number of people entering or exiting the station. The sheer number of people changing trains at Clapham Junction and the need for sufficient interchange facilities is one of the two major problems that still needs to be addressed. The other is the obvious one – the need to run more trains through the station. That’s not to say that a huge amount of work to tackle the interchange issue hasn’t already been done. As with a lot of enhancement programs, however, one must not presume that just because a lot of (passenger) capacity upgrade has taken place in the past the problem has been solved for the foreseeable future. 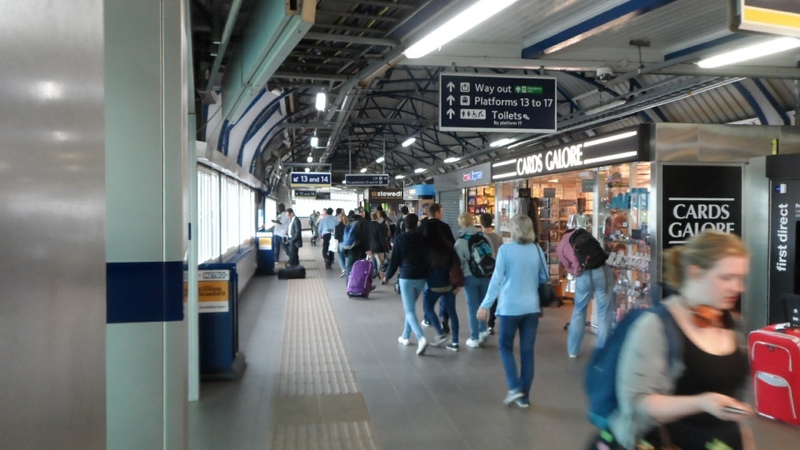 Indeed one of the problems, if one can call it that, is that the very improvements designed to relieve passenger congestion within the station inevitably make the station more attractive to use. The reopened entrance in Brighton Yard is a perfect drop off point for passengers and seems to attract a steady stream of “kiss and ride” passengers who may well have not have previously used the station. Not only that but this reopened entrance provides relatively secure covered storage for cycles, thus attracting another group of users who might have previously been reluctant to consider Clapham Junction. The original glass in the waiting room can be made out through the new double glazed windows that have been installed. A triple glazed railway waiting room! Many passengers nowadays seem to have remarkably voluminous and heavy suitcases that would have simply been almost impossible to lug around before lifts were installed serving all platforms. Using Clapham Junction in the past oft-times also involved the unpleasantness of waiting on a platform on a freezing winter’s day. For users of platform 13 or 14, at any rate, this is now tempered by the refurbishing and reopening of the former platform waiting room after many years of alternative use. 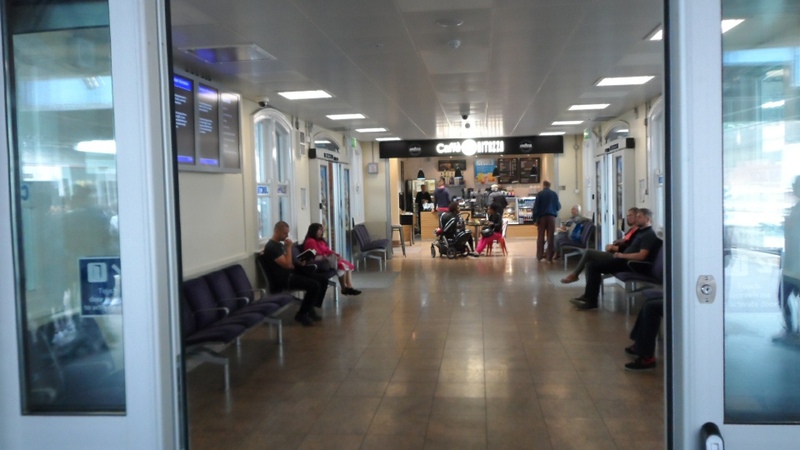 The newly re-opened waiting room on platforms 13 and 14. On a good day the panels provide details of train departures. 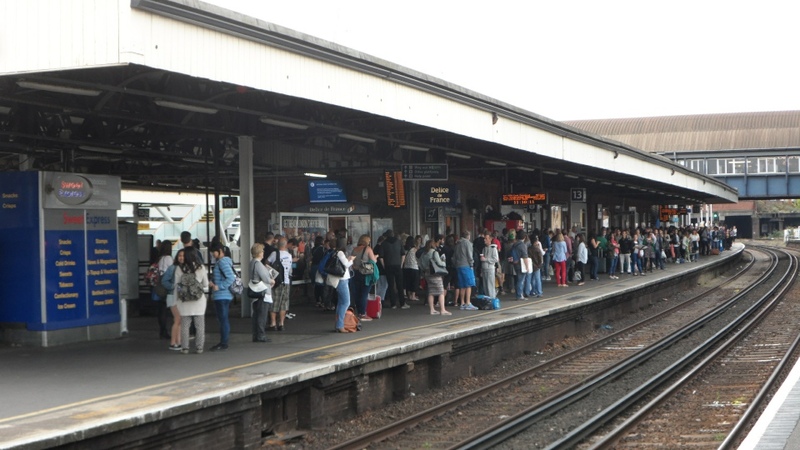 Clapham Junction has also become considerably busier in the past ten years – far more than the average increase in passenger numbers across London as a whole should dictate. In fact in the past ten years both entrance and exit figures and interchange figures have nearly doubled. There is no obvious single reason for this increase, but one factor is certainly the change in the nature of fast train stopping patterns. Within recent living memory Clapham Junction was basically just a suburban station with all-stations services stopping there. Most fast trains passed through without stopping. 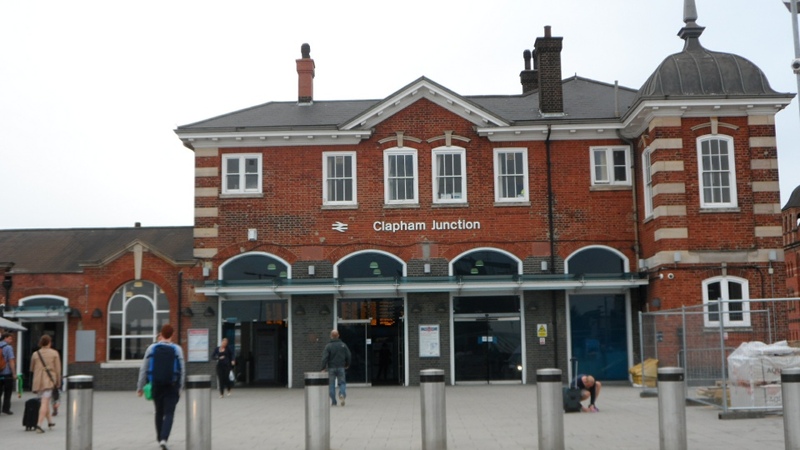 Not only that but the trains that did stop were never advertised at Victoria as stopping at Clapham Junction and the timetable would mark Clapham Junction as pick up only. 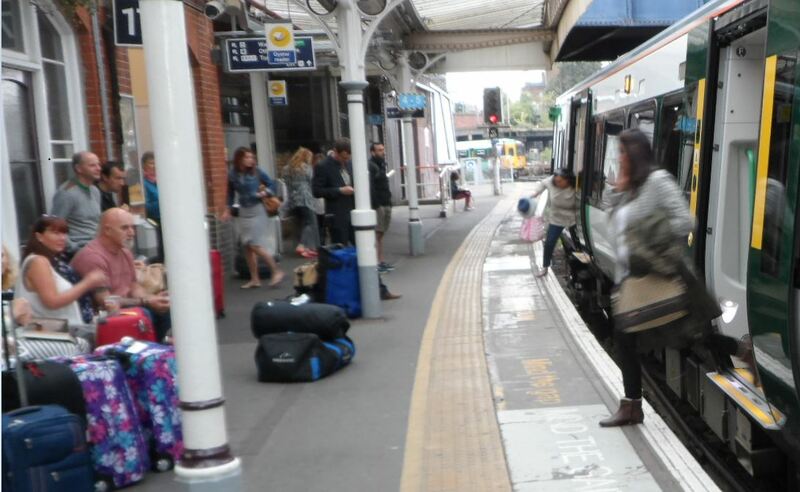 Whether this was to make sure space was available for those joining at Clapham Junction, or was to minimise the critical dwell time there is not known. What is known is that a lot of savvy commuters at Victoria knew anyway which trains stopped at Clapham Junction and boarded them regardless. What is clear is that as more trains stopped at Clapham Junction more people changed there. So long as you don’t have to wait too long for a connecting train there are a lot journeys that are best made via Clapham Junction. For example, if going to Heathrow from East Croydon, and you don’t want to pay for Heathrow Express, then the fastest way by public transport is by train to Feltham via Clapham Junction and then bus to either the terminal or to Hatton Cross to pick up the Piccadilly Line. Surprisingly East Croydon to Wimbledon via Clapham Junction beats the direct tram. What is surprising about the information displayed at Clapham Junction, given it is a major interchange station, is just how difficult it is to find out which platform your next train will depart from. This is not such an issue if using National Rail Enquiries website to plan your journey as the platform will be shown. Nor it is an issue for most regular travellers. On the other hand for passengers who are unfamiliar with the workings of the station changing at this station must be quite a daunting prospect and something it is not really geared up to. This of course is worse if the unfamiliar traveller is travelling with luggage. 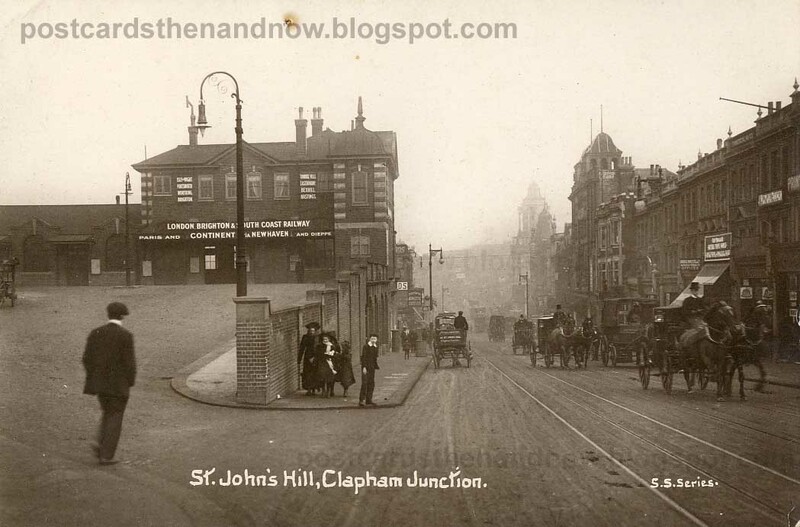 For many years the only way in and out of Clapham Junction station was by means of an underground subway. This could, of course, be used for interchange as well. In addition to this there was an overbridge providing access to all platforms but no entrance or exit. The overbridge is spacious – or at least was before they put retail units on it. It has copious displays and boards at the top of the steps to each platform giving information about train departures and passengers can find which platform they need without obstructing the passageway. Unfortunately they can only do this by checking each platform in turn. The lack of information about trains from other platforms can be particularly frustrating if wanting the West London line. In the morning peak hour, for example, from 08.00 there are 4 trains from platform 1 and from platforms 16 and 17, at the other side of the station, there are 2 further trains from each platform (8 in all). The subway, by means of a contrast to the overbridge, can become very cramped and, when busy, it is difficult to find which platform your train is due to depart from without obstructing other people. There is the same problem when it comes to catching a West London Line train. Subway at Clapham Junction. For many years you had to use this to enter and leave the station. As recently as 2011 there was a huge improvement in interchange facilities as a result of an Access for All scheme at Clapham Junction. The program naturally included lifts to all platforms but it also needed to provide step-free access to the street. This it achieved by re-opening a long-closed entrance on a road called St John’s Hill. The entrance is called the Brighton Yard entrance but somewhat confusingly the other long-standing entrance on the eastern side is also in St John’s Hill and is called the St John’s Hill entrance. 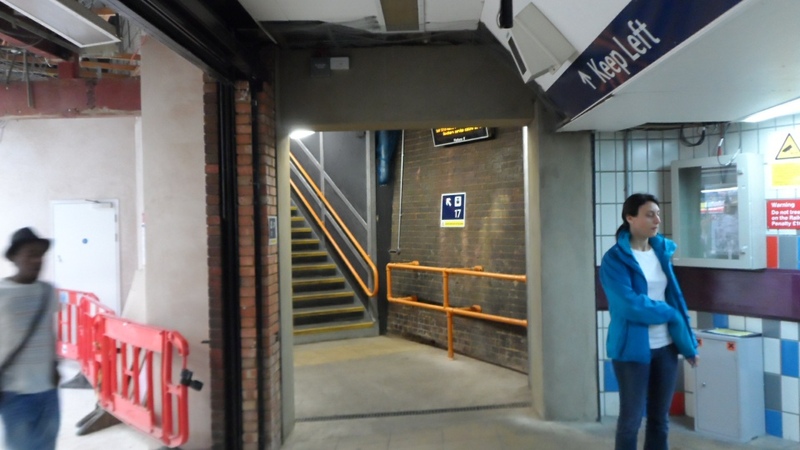 As a result of the reopening of the Brighton Yard entrance Clapham Junction now has three distinct entrances. Another important aspect of the Access for All program was to replace the toilets which were unsatisfactorily located in the subway. The new ones (including a disabled one) are at the end of the footbridge by the new Brighton Yard entrance. Sadly they are not always as clean as one would like but at 20p they are 10p cheaper than most toilets in London terminals. Overbridge at Clapham Junction complete with retail units. The Access for All scheme was not cheap – as you would expect at a station of this size. The final cost was £13.2 million at 2011 prices. One reason for its justification was that by doing just this one station it opened up a host of newly possible journeys with step free access – although the problem of the gap between the train and the platform, particularly bad at Clapham Junction, remains. Like all Access for All schemes, the benefits of Access for All benefit all passengers whether considered disabled or not. 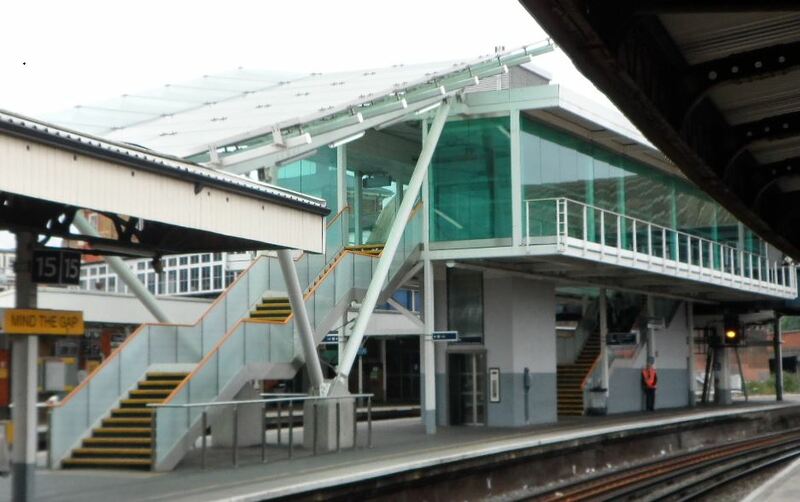 In the case of Clapham Junction the reopened entrance relieves pressure on the subway and many platforms received much-needed improvements to the stairs as well as new lifts. London Overground already had a presence at Clapham Junction as its 3 car trains on the West London Line terminated there. Subsequent to the Access for All work at Clapham Junction the presence of London Overground has increased with the arrival of trains from the East London Line at a new platform 2. Meanwhile the 3 car trains have been replaced by 4 car ones. 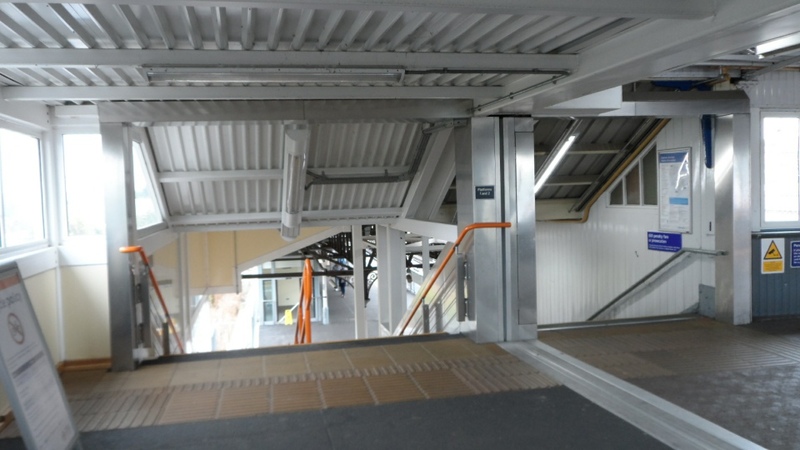 The extra demand created by the enhanced presence of London Overground has led to a new staircase being built next to an existing one from the London Overground platforms to the overbridge – such is the popularity of London Overground here. This popularity can be clearly seen on days when there is exceptional demand. A typical example is during tube strikes but a more recent example is the blockade at London Bridge. So expect the London Overground to be very popular at Clapham Junction between Christmas 2014 and New Year when the second London Bridge blockade will take place. On these days crowd control measures are implemented on the overbridge, which is fortunately very wide and unobstructed at this point, and the bridge appears to be able to safely take the weight of the intending passengers queuing on it. One very obvious problem is that the nice wide staircase to platforms 1 and 2 from the overbridge is the intuitive way to exit the station via the Grant Road exit (also known as the Winstanley Road exit) on the west side of the station. 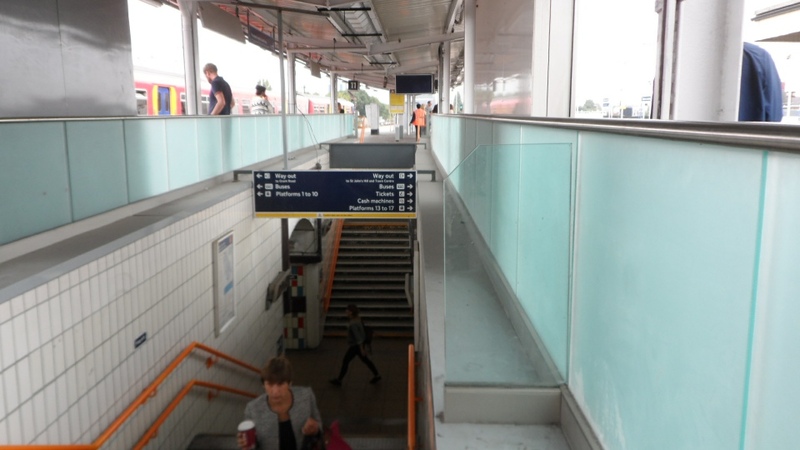 The users of this wide staircase, unless catching a London Overground train, are funnelled into a much narrower staircase from the platform to the paid side of Grant Road ticket office. It is therefore not at all surprising that a commenter reported that there was a rumour that Network Rail were looking at a fourth exit from the west end of the footbridge onto Grant Road. Such a footbridge would logically complement the new Brighton Yard entrance on the east side of the footbridge. It would also mean that there was an entrance at each end of the subway and also at each end of the footbridge. An alternative possibility, with many of the advantages of a new exit from the west end of the footbridge, would be an entrance from Grant Road that led directly to the London Overground platforms. This would reduce the height of any new staircase (or escalators) required which would be substantial at this point. Assuming the rumour of plans for a fourth entrance to be true, what may be a big consideration as to the exact configuration of such access is whether or not there is a need to preserve the possibility of bringing the long abandoned platform 1 back into use. Curiously this is now designated platform 0, although there is no track alongside. 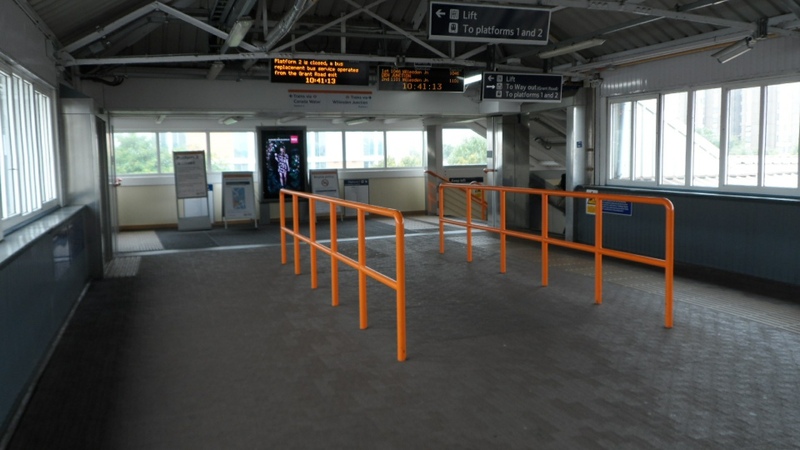 Reinstatement of platform 0 would be expensive, which is why London Overground opted for the cheaper option of staggering the original platform 2 to provide two separate short platforms – now numbered 1 and 2. Although expensive though, it would actually be relatively easy to do by replacing the deteriorating ironwork that supports the foundations of the track at that point. Of course, inevitably, Network Rail engineers can’t see a piece of disused trackbed without feeling an overwhelming urge to put some trackside apparatus onto it so there would also be the issue of the relocation of a few trackside cabinets. Work on the current platforms 1 and 2 is not the only major platform work carried out recently. In the past few weeks platform 17 (the down West London Line) has been extended from 4 to 8 carriages. From the adjacent platforms this may have looked like a simple job, but the platform is at a considerable height above ground level and the worksite was more substantial than one might initially expect for what would appear to be a straightforward platform lengthening task. In many ways the result is rather unsatisfactory, with a wiggly shaped platform on a slight slope, but it is hard to see how that could have been avoided without substantial works. 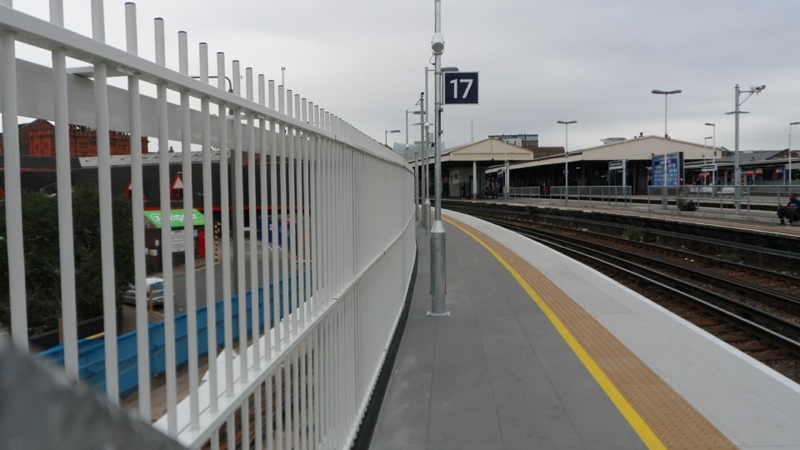 As part of the work to extend the platform, direct access was provided from platform 17 to the subway and consequently to the St John’s Hill exit. This should do a lot to overcome the feeling that platform 17 is the hidden and inaccessible platform at Clapham Junction. Unfortunately it is not as clearly marked as it could be and so it easy to walk past without noticing it. 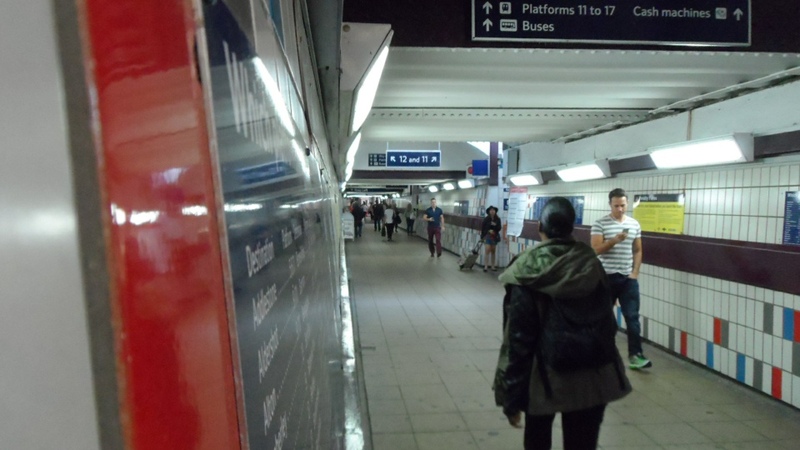 The far-from-obvious location of the lift for platform 17 may mean the perception of the platform being difficult to find is replaced by a new one of being difficult to access. Even without the problem of finding the lift there may be good reason for this perception as the step between the train and the platform is rather large. This gap is terrible on most platforms at Clapham Junction, but is truly awful on platform 17. There was clearly a need to make Clapham Junction suitable for the number of people that use it. Many would say that the need is still there despite the many improvements made. If there is any comfort it is that for above-ground stations this is generally a very solvable problem. What is often far more intractable, and certainly is the case at Clapham Junction, is to provide a better rail service by stopping more and longer trains there. Because we are looking at the service to and from Sussex we really only need to look in detail at the Sussex fast lines which normally use platforms 12 and 13. These are very busy platforms both in the number of people that use them and the number of trains stopping there. In addition to the stopping trains on the lines through platforms 12 and 13 there are 4tph Gatwick Express trains that do not stop but pass through. Nowadays these are the only Southern trains not to stop at Clapham Junction (Gatwick Express being run by Southern) and we are told the only reason they don’t stop is because the dwell time makes it unfeasible. It has been a long term aspiration to have Gatwick Express trains call at Clapham Junction but it just isn’t possible without reducing the Southern service elsewhere. This would be the case even if the Gatwick Express service weren’t run using class 442 units featuring 23m carriages with a single door at each end – something which would lead to horrendous dwell times. As well as the issue of dwell times, class 442 trains were built with ancient underpowered traction motors salvaged from earlier stock. This means that running the trains fast through Clapham Junction is very useful to make up time that is lost by being unable to accelerate as fast as other trains on the line. The new TSGN operators that will run the service in future intend to replace the Gatwick Express trains with modern stock but that will not be enough to make it possible for these trains to stop at Clapham Junction. Although the reason given for not stopping Gatwick Express trains at Clapham Junction is the dwell time, another consideration is, or ought to be, the ability of the station to handle more airport passengers. The lifts can be pretty busy as it is and a solitary small lift at each platform would really be quite inadequate for dispersing jet-lagged airline passengers with their large wheeled suitcases. Platform 12 is quite busy enough in the morning but fortunately it has four staircases and a lift. A small crowd of tired and lost airline passengers would probably interrupt the relatively good flow of passengers. The enormous structure housing two staircases and a lift on platforms 15 and 16. There is similar structure on platforms 11 and 12. As an indication as to how well used a stop at Clapham Junction for the Gatwick Express might be, it might come as quite as surprise to those who don’t use the line just how much a Southern fast train originating from beyond London can empty out at Clapham Junction on its morning inward journey. It is not unusual for a train that has many standing passengers on approaching Clapham Junction to have all passengers seated on departure. In the evening the fast down platform (platform 13) has throngs of waiting passenger preparing to join at Clapham Junction and here the converse is true and a train that may not have been that crowded on leaving Victoria is packed on departure from platform 13. The problem with the tracks through Clapham Junction fast platforms is that they cannot handle any more trains. During the peak period there are roughly 16tph and of those four are Gatwick Express trains that don’t stop there. With the current signalling this is about all that can be achieved. So what is to be done? There are some minor improvements that have been and can be made. Beyond that Network Rail currently has two ideas as to how to solve this. Unfortunately one option is expensive and the other one is very expensive. The first minor improvement was implemented not that long ago and was very simple. Indeed the wonder is that it hadn’t been done before. All it involved was issuing an instruction to train operating staff that Southern up trains (fast on platform 12, slow on platform 14) were not to wait until their booked time to depart but were to leave as soon as they were ready. In other words trains were not to hog the platform unnecessarily. The second thing that could be done is to reduce boarding time by making sure the gap between platform and train was minimised. Even if this could make 5 seconds difference per train then this would amount to a minute in each hour. 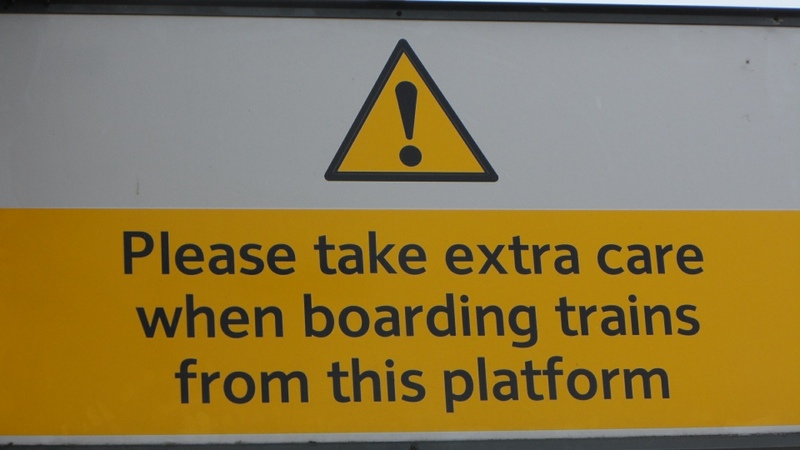 The height of the platform might not affect fit regular commuters so much but can make a considerable difference to the time taken to board by those who carry heavy suitcases, push a buggy or have a slight disability. Is modern signalling the answer? Unfortunately, beyond optimising the platform, something big needs to be done. One approach that Network Rail is looking at is very simple in principle. Run the trains in automatic (ATO – Automatic Train Operation) mode to increase throughput. Tests run on simulators as part of the Thameslink Programme have convinced Network Rail that this would make a significant difference and the benefit would also apply elsewhere. Not only would it eliminate the human factor that leads to over-cautious braking, it would allow trains to “creep up” on the previous train so the next train occupies the platform much sooner after the previous train had departed. This is what happens on ATO lines of London Underground in order to obtain train frequencies that are just not possible with manual driving. Naturally updating the signalling would not be cheap but ATO in the form of ETCS (European Train Control System) could be overlaid on top of a modern existing signalling system. It would also follow that it would be very difficult to justify the cost of fitting this both to the track and to the trains just for this one problem. However, as we shall see in future, ETCS would be of benefit elsewhere so it is believed that in the early 2020s this could be a viable solution when all the potential benefits considered together. Even if ATO were viable though, it probably would not buy much extra capacity at Clapham Junction. In any case that capacity may be very quickly used up if it was decided to allow a station stop at Clapham Junction for Gatwick Express trains. So it looks as if something more radical would be required by the mid 2020s. There have been various schemes to resolve the issues at Clapham Junction. In the early days of privatisation, Sea Containers, who were bidding for a franchise, proposed a radical scheme involving relocating the station. In those early Railtrack days there was a bit of a presumption it would be the TOCs who would lead the way on enhancements. That first round of franchising did have some interesting ideas inspired by TOCs. It did seem though that the scheme had not be fully, or even partially, costed and in any case there was not any absolute commitment to invoke the scheme if a TOC got the franchise. It was also the case that a short franchise of about seven years would be woefully short compared with time it would take to fully implement such a solution and it would be far from clear what would happen if the franchise were not renewed. In a similar vein to Sea Containers there was the scheme, probably initially developed by Railtrack, for two enormous towers at Clapham Junction to fund a rebuilt station. Not surprisingly Wandsworth Council were having none of it and that may have been influenced by Railtrack having a record of not being too enthusiastic in actually getting down to implement schemes that they were supposedly committed to – Thameslink 2000 being a particular case in point. Since then Network Rail have worked up the basis of a scheme to use what Southern platforms they have more effectively. In particular platforms 16 and 17 (West London Lines) may see one or two trains an hour whilst the next pair (14 and 15 for the Southern slows) would be pretty much at capacity with 16tph and the fast platforms, as we have seen, have no spare capacity at all due to a combination of dwell time and sub-optimal signalling. The idea is simple in principle although probably very expensive to implement. Install facing crossovers so that platforms 12, 13 and 14 can serve the fast lines and platforms 15, 16 and 17 can serve the slow West London lines. In simple terms, organise platforms 12-17 in a manner very similar to the current day platforms 1-6 at East Croydon. In the morning peak platforms 12, 13, 15 and 16 would be up lines and 14 and 17 would be the down lines. In the evening peak the situation would change so 12 and 15 would be up lines and 13, 14 and 17 would be down lines. In the evening peak platform 16 would still have to handle the up (e.g towards Shepherd’s Bush) West London Line traffic as this would not be accessible from platform 15. Ideally platform 16 would also be able to handle down trains in the evening peak as well but the track south of the platform is already sharply curved and it could be very challenging to install a crossover which would be necessary for this to be possible. London Reconnection’s understanding of how Network Rail would use platforms 12-17 if one of their proposals were to be implemented. Morning peak working is shown. An obvious problem with this scheme is the lack of length of platform 17 which has only in the past few weeks been extended, rather awkwardly, to be 8 cars long. Because of the need to extend slow platforms for possible future 12 car use and, in the case of platform 17, straighten it out, it is presumed that this scheme would not be possible without obtaining additional land. In the event of such a scheme going ahead, one suspects that one day it will be hard to do one’s local shopping at Lidl if living near the station. If plans for the distant future come to fruition it would seem that Clapham Junction will just get busier and busier. There are plans for a Crossrail 2 station here in around 2026. This might provide some relief for the South West Trains lines but for the Brighton Line it is not going to provide any relief here. In fact it will probably make the situation worse as people change to Crossrail 2. The one silver lining for the Brighton Line may be that, with an alternative route from Clapham Junction to Victoria, it could in future be possible to carry out major reconstruction and maintenance projects at Victoria without inconveniencing passengers too much. Beyond Crossrail 2 we have a very tentative proposal to further extend the Battersea Extension of the Northern Line to Clapham Junction in the 2040s. Like Crossrail 2, it is hard to see how this would help relieve the Brighton Main Line at its busiest as the only relief it would provide would be north of Clapham Junction but, as we have already seen, the busiest stretches of line are south of Clapham Junction. Returning to the near future, it would seem to be the case that capacity problems at Clapham Junction are solvable if enough money is thrown at it. Naturally, as far as looking at capacity in Sussex is concerned, these are only relevant for trains going to Victoria. Before we get further down the line we need to look at the London Bridge side of the Brighton Main Line and we will do that next. Thanks to ngh for drawing the track diagrams and various people at Network Rail for giving an outline as to what their plans for the future may involve. Sorry to resurrect this thread, but only just arrived at it! Surely there is a an interchange only location on the LU network? Southwark, if memory serves me, has two exits, with one heading up into the East end of Waterloo East, but with no exit or entrance to/from the street. I recall being confronted by the frankly idiotic sight of two gatelines, with nothing in between, a sort of no-mans land. if you had problems with one or other of your tickets, you were stuck there, and at the mercy of benevolent station staff when they finally intervened. We’ve noticed that one before – I even raised a safety question re exits from that no-man’s land area with ORR, some time back. The answer was that, for those barriers to be “closed” there had to be staff present, so that the problem of permanent “trapping” could not (in theory) arise. I’ve just re-read the whole of the article and comments. I went to visit the Grant Road entrance to Clapham Junction yesterday, having 20 minutes to wait for my train. I still don’t know why the Banana Arches are called that but I did get a nice look at them and at platform 0. There are some lovely photos in the ELLX Phase Two article on here as well as a description of why the arches are not sound. However, bringing platform 0 back into use does not seem an insurmountable problem. It requires fixing the arches and moving some equipment on the platform. Yes, it’ll take money but it’ll be cheaper than half the schemes proposed up-thread. Afterwards in the peak, London Overground can run 4tph 5-car shuttles to Shepherd’s Bush out of platform 0 followed 5 minutes later by 4tph 5-car full services to Stratford out of platform 1, with a similar service in the opposite direction. This would do wonders to reduce the overcrowding in both directions in both peaks over the first few stations out of CLJ. Southern can continue to run their 2tph East Croydon-Watford Junction/Milton Keynes services through Platform 16 or 17 without so many people attempting to board at CLJ. It will also mean people like me don’t have to walk back and forth between each end of the station trying to board a train. Clapham Junction probably has more passengers interchanging than entering/exiting. @Hedgehog – Lots of money, as in tens of millions, alas. The Banana Arches have that name because Fyffes (banana importers) had a storage and ripening business in the arches between the Winstanley Rd entrance and Falcon Rd. Indeed alas. But eventually more capacity will be needed on the WLL. I take the journey every day and it’s crowded. Going from 4-car trains to 5-car trains has helped enormously (it used to be the different between getting on a train and not) but demand will continue to rise. The situation will be improved by double-ending Imperial Wharf across the river, so it is easier to cross without taking the train. An alternative might be running some extra trains straight from Wandsworth Road to Imperial Wharf and onwards. It wouldn’t help Clapham boarders but would ameliorate demand at subsequent stations. Sorting P0 will almost certainly result in 8 car LO WLL services rather than doubling the number of 5 car services (lack of paths) and timing for the works might well align with CR2 works at Clapham Jn. By “double ending” Imperial Wharf you are presumably referring to the pedestrian bridge plans? Planning Permission for a footbridge adjacent to (but,following intervention by English Heritage,not attached to) Cremorne Bridge has been granted. Yes I was referring to the pedestrian bridge. 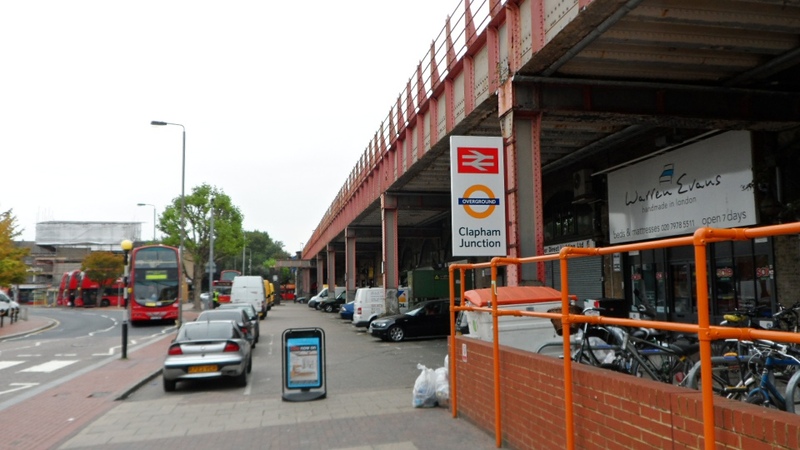 A lot of people travel Clapham Junction – Imperial Wharf and I suspect they’d have an easier journey by bus and foot, especially if they are travelling “backwards” to Clapham Junction in the first place. From what I saw on Friday, platform 0 could be opened at 8-car length. However, to my knowledge, the stations beyond Shepherd’s Bush towards Stratford can’t take trains that long. NR’s Sussex route study final version reckons the future of the WLL will be for 8 car LO trains, while accepting that has ‘implications for through running’ to the NLL. As I understand it, the condition of the structure supporting platform 0 is such that it cannot be opened at all, and would have to be replaced before anything as a heavy as a train is put on it – this is why the current layout of platforms 1 and 2 was adopted. I meant if/when platform 0 is cleared and the arches underneath repaired. It’ll be expensive, yes, but things will come to a point when the capacity is needed. Also, concentrating trains up the WLL from one side of station will prevent people like me needing to run back and forth between 1 and 16/17 in the mornings. Platforms 16 and 17 can continue to handle the long Southern services, with Clapham Junction boarders told to go to platforms 0 and 1 instead. I said 8-cars because the 4 subsequent stations on the WLL have had their platforms extended recently to 8-car lengths to allow 8-car Southern trains to call there. A business case for sorting P0 is largely based on 8 car WLL/NLL as there are a limited number of paths on the NLL/ WLL rather than more 5 car services. A few stations would cause issues but the worst would be 7car and SDO. The ELL is a rather different beast to lengthen services on but has more possibility to increase services with resignalling hence P1 is more likely to get used for improved ELL services. CR2 will also help with the short cross river hop. Ultimately the final OOC plans will also play role in what happens. There is lots of space beyond the country end of p2 to extend into. It may be cheaper to shift and lengthen both p1 and p2 westwards rather than strengthen and rebuild p0. What’s the limitation on paths from Clapham Junction to Stratford? Current we have 8tph Clapham Junction to Shepherd’s Bush in the peaks (4tph Southern branching off to Watford Junction) and 4tph Shepherd’s Bush to Willesden Junction, then 8tph Willesden Junction to Stratford (including 4tph from Richmond). It would make sense to run long trains from platform 0 up the WLL/NLL and use platforms 1 and 2 to run frequent short services along the ELL. The problem there is that the ELL core can’t take more trains. If some ELL services could be stopped short, that would make things easier. it seems odd to mention increasing train frequency on the ELL though resignalling almost in the same (written) breath as talking of the limited paths on the WLL. Ultimately, I imagine, that WLL will need to be properly sorted out including dealing with the appalling permanent speed restrictions north of Olympia and changing from 25kV to 3rd rail and vice versa without stopping. It’s ngh above me who says that there are limited paths. It’s not a subject where I have a lot of knowledge. More accurately, ‘nominal’ freight – no actual paths used but slots reserved – is the bottleneck on WLL especially, less so on NLL. Network Rail ought to be selling these slots to LOROL really. @MC – and they prevent a nice even clock face service pattern. Channel Tunnel freight traffic is a particular issue. There are 35 specified paths via the WLL each way per day of which only about 30% are used. This reflects problems with freight operations through the tunnel and optimism in the original forecasts. The paths are protected by international agreements until 2052. These are likely to be very difficult to change. It would be embarrassing to have to spend substantial money on engineering to maintain freight paths that will never be used. I believe that the Eurostar Regional passenger paths were eventually released for use. In London, it would indeed be the first Thames bridge since the Millennium Bridge and the Golden Jubilee Bridges – unless the two-legged white elephant gets built first. Regarding freight paths and at the risk of a terrible pun, I would at least set a regular inteval timetable and “cross the freight path bridge if we ever come to it”. There must be capacity elsewhere in the SE that is effectively sterilised as the trains have bave to get from the Channel tunnel to the WLL somehow. I have often wondered why that isn’t done. Surely if it comes from the Channel Tunnel they must get a few hours warning? And presumably a fair about of warning in the other direction if the path has to be booked? So in these days of online updates why not simply cancel the passenger train with three hours (or whatever) notice and have a delay regime where the TOC is not penalised for the cancellation because the train was effectively a “bonus” train that was not part of the core timetable. @PoP/100andthirty – I suspect that part of the problem is that it still seems impossible to get freight to stick to the timetable and present to the specified path at the specified time – an issue compounded by the general lack of recessing facilities and the fact that freight paths tend to cross a multitude of passenger routes. But that almost strengthens the argument not weakens it. If you can’t rely on the freight turning up at the proper time then you might as well put a passenger train in the slot on the understanding that the passenger service provider will have to cancel a that or another train to free space for the freight train. Infrastructure improvements may be necessary to enable “parking places” to be available at relatively short notice but I suspect it would be worth it if it freed up a lot of slots. If only platform 0 was in use and extended to middle siding (south of platform 2). Jubilee Bridge: The foundations for the bridge on the Battersea bank side are currently being built as part of the redevelopment of the adjacent site. For example the aggregates from Acton (most loads originate from Merehead /Isle of Grain) to Purley / Crawley / Tolworth / Newhaven (via WLL other non WLL destinations too) or aggregates along the Windsor lines to / from Angerstein / Cliffe or NR engineering trains from Hoo – Eastleigh Yard which limit the use of P (0) 1 & 2 at Clapham Jn. I don’t often wander down the country end of platforms 1 & 2 but I’ll have a look tomorrow after work to see if tracks at platform 0 could be extended backwards. Carto Metro implies that the extension of platform 2 has blocked the area where the connection used to be. I thought for a while how you would explain these to passengers. However, with a “turn up and go” service, many wouldn’t care that this was the 1125 rather than the 1130 as long as it went in the right direction. If you need to, they can be shown on departure screens as “extra” or “relief” services. I can recall a busy Saturday at my local bus station when I was little, wondering where Duplicate was, as there were so many buses with that name on the destination blinds. It is located in the same parish as the village of Loose Chippings which is a mile away. The biggest issue is that the new widened staircase from the footbridge protrudes into the P0 track bed slightly which is one of the reasons P0 is on CR2 list as the over- footbridge needs a direct access to Grant Road and better access from P1/2 to the pedestrian tunnel to enable those stairs to get narrowed slightly. The middle siding including points at the country end were completely replaced during the P1/2 platform works and this is not a problem. Discussed on LR the day the points were being installed! There is a German village of an equivalent name: “Rollsplitt”. I did indeed have a look around the platforms after work on Wednesday and noticed the issue of the widened staircase. Is National Rail considering a 4th exit for Clapham Junction: from the overbridge down to Grant Road? And a 5th too as part of CR2 as well. Where would the 5th entrance go? On the St John’s Hill, there is already an exit from the underpass and an exit from the overbridge. An exit on the other side, from the overbridge to Grant Road, is a very good idea. In the bus turning area behind the bingo hall on the other side of the BML and SWML adjacent to P7 away from the other 2 St Johns entrances. Where the old (?1903-1950s?) L&SWR entrance was? Platform 0 is being looked at, in both 5 and 8 car lengths, the footbridge being the demarcation between the two. Options include refurbishing the viaduct, rebuilding where it is or widening out towards Grant Road to make the platform a decent width. There is space for an 8 car siding beyond the platform. Integration with CR2 will be key. The “middle siding” is only 5 cars long at the moment. Platforms 1 and 2 have lots of scope for lengthening if the siding can be removed. I see what you mean by an entrance to platforms 7 & 8. I didn’t appreciate how far back they go towards St. John’s Hill. It’s a good idea. Wandsworth council were already working on a regeneration of the neighbouring estates which was due to include re-landscaping Grant Road itself plus the construction of some tall buildings, and aren’t too keen on it all being safeguarded for CR2. This site quotes their position extensively. In summary WW say “the land near the station is the highest value part without which the whole regeneration doesn’t add up, can’t you use the Asda carpark or something instead?” and DfT/NR/TfL say “no, we’re safeguarding Grant Road, tough cheese”. Not sure if that’s the end of the story or not. It’s quite frustrating to see residential and transport interests apparently at loggerheads here when the obvious opportunity is for both to help each other (property development boosted by CR2 links, CR2 boosted by massive s106 money). P.S. “..since I’ve come over all sentimental..” that’s because my day return trip yesterday to Sheffield on the Midland Main Line* in modern diesel electric trains yet again gave every impression of being (I can’t even describe it as “sitting comfortably”) in the noisy engine room of a cross-Channel ferry in stormy waters for two hours each way. If I’d sat in the “window seats” reserved for me, it might just as well have been below deck because the seat spacing provided in the coach almost everywhere an impenetrable wall to the outside world rather than a window to look out of – and all of that was in the 1st Class bit. So, I wish that trains today were designed to include the feelings of passengers who are forced to use them. Beware the Thameslink Class 700’s and let’s see how the travelling public react to those, for example – and I have no wish to hear informed comment about compromise for the multi-purpose intentions of that rolling stock. A shot from 1955 showing the old L&SWR ramp and Porte Cochere entrance on St John’s Hill…presumably roughly on the site of the proposed new entrance? Road entrance in the same place but on the railway side the shed and tracks in part of the yard are moved so they are parallel to the Windsor lines with the CR2 southern entrance and escalators and lifts where the short engine sidings currently are and links to the footbridge on the long gap in the footbridge. I completely forgot to comment on the Crossrail 2 consultation. Silly me. I’ve had a look at the fact sheet for Clapham Junction. It looks like the proposed new entrance on Grant Road will just be down to the underground Crossrail 2 platforms. I hope it includes an entrance from Grant Road to the overbridge. You’re right. This could be done in an integrated fashion. Mott MacDonald have just published a proposal for a “new future for Clapham Junction Station”. However, although it acknowledges that “building a new station around an existing station is hugely complex and expensive”, it would appear to be more influenced by the “vision” of urban planners rather than the practicalities of interfacing with a busy operational railway. It’s not immediately obvious if there is a client in mind at this stage. I suspect that LB Wandsworth might be supportive, though it has not yet featured in the news section on their website. The proposal includes provision for Crossrail 2, but doesn’t consider extending the Northern Line from Battersea. Someone’s bound to suggest it! @ Brock – that Clapham Junction “proposal” looks appalling. I don’t see how it works in transport terms at all. I may be misremembering the layout of Clapham Junction but the sketches seem to imply a far greater difference in height between rail level and the surrounding streets. Quite why tracks seem to be on viaducts within the station concourse is beyond me. Do we really need multiple railway tracks covered over in order to perpetuate the planners’ dream of “greenways”? Can they just leave railways to be railways and just accept that they are a valid part of the urban environment? It just looks to me like an attempt to grab an enormous amount of land / airspace for the private sector with a revised station as some sort of side effect. I’m boring and think that the transport needs should come first, second and third at a strategically important place lke Clapham Junction before we start a mass redevelopment / “cleansing” of another part of Wandsworth borough. The download brochure explains it best. It looks like London Bridge MkII – with the benefit of completely straight platforms – with an air rights job over. Making the station fully accessible would be well worth it. The gaps that need to be minded there are frightening. I’d say it’s putting transport needs right at the top in that respect. London Bridge proved you can rebuild a station like that if it’s planned well. NickBxn: ” London Bridge proved you can rebuild a station like that if it’s planned well.” “Proved” may be a little bit strong here. Of course good planning is essential for such a scheme (or indeed for any scheme at all). But it’s not the only requirement. No amount of planning will work if either (a) the objective is unachievable, or (b) there is not enough money (or other resources) to do it properly. Of course deep scepticism is required here. But I was slightly re-assured to see that in addition to the glossy pictures and buzzwords (essential these days), the downloaded document does include an “Illustrative Platform Layout”. Feasibility would require much more detailed work to determine, but my initial reaction is “Well, maybe it’s not completely stupid”. But I also agree with the overall views of @WW. I suspect that the planners were attempting to emulate the development potential of Old Oak Common, but there are significant differences. A key one is that it is much easier to put in a development deck during the construction of a completely new line or station rather than on an existing operational railway. (Examples include Canary Wharf Crossrail and the passive provision for over-station development at Shoreditch High Street). So at OOC it’s only the HS2 platforms and possible Chiltern platforms which will be covered. The proposed platforms on the GW main line are not planned to be covered, nor is North Pole Depot. And even the deck across the HS2 station recognises the need for ventilation and emergency escape routes and is mainly planned as open space. (Similar to Canary Wharf Jubilee Line). There are some good rail planners at Motts – I fear that they were sidelined on this project. I wonder if any of them read LR? There are some interesting and potential useful features in that plan. It is a little difficult to understand the platforming arrangements – the Windsor-side platforms 1-6 appear to be more or less unchanged, except that the bay platform (new No 1) seems to have been lost. The others have been moved further east – their western extremities being roughly where the footbridge now stands – straightened, and extended at the London end by taking some land on the south side of the tracks currently occupied by the Lidl supermarket. There is also one more platform on that side than currently is the case – currently there five islands and a side platform, the diagram shows six islands – but it is not clear how they would be used – the diagram shows twelve tracks in the station converging into seven in the cutting SW of the station where there are currently eight, thereby apparently reversing the last significant change in the layout, back in 1903. Another unresolved question is that moving the two most southerly platforms (currently 16 and 17) further east would require steepening the gradient leading down from them to the underpass under the main lines towards London connecting them to the West London Line. That is already a stiff gradient, and whilst the class 377s running Southerns’ Milton Keynes – Croydon service could probably cope with the steeper gradient, the line also sees a significant amount of Cross-London freight. I don’t understand the comment about the platforms being put on a viaduct – they already are at the London end (note that the subway is a ground level – and so is the footbridge: the clue is in the name of St John’s Hill). The Green Path above the station effectively moves the hillside further east, bridging over the station instead of being cut into by it. Decking over the railway here not only provides substantial income to pay for the railway remodelling, but also greatly improves the neighbourhood. The station and Clapham Yard occupy a huge area, resulting in little connectivity between the Winstanley Estate (north of the railway) and Battersea town centre (to the south). It is not a pleasant walk along Falcon Road under all the railway lines. The scheme also means that passengers are interchanging and waiting for trains under cover. It’s worth noting that railways have been diverted underground or decked over in a number of European cities in order to improve the urban realm. Delft is a recent example. Sub-surface station design has moved well beyond the Birmingham New Street dungeon model, so what’s not to like? Implementation would be interesting, not just in terms of engineering, but also cash flow. It is unlikely the deck could be constructed and commercial development proceed until after the railway works are well advanced, mainly because the supporting structure has to fit around the new track layout, not the old one. 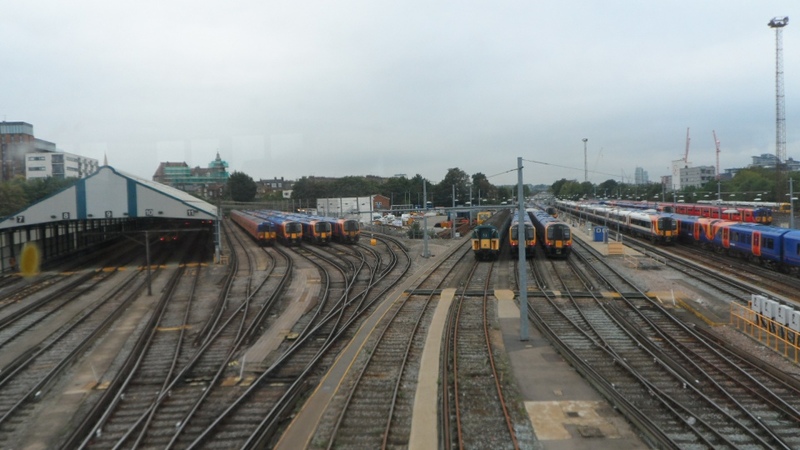 Keeping Clapham Yard open during the project would be a challenge, particularly as the area might be needed for temporary diversion of running lines while the Windsor side was being rebuilt. Finding somewhere else to stable trains would probably be an essential preliminary scheme. And looking at the Mott proposal. Only one platform for the the Overground on the N side? No reopening of the old platform 1 (Banana siding? ) – a definite serious mistake. Four platforms for the “Windsors” – yes. Ten platforms for the LSW & LBSC mains, as opposed to nine at present – a needed improvement, but still, maybe short in nuimbers – but where would you fit them, given the curvature? As noted, the gradient on the down line from the Latchmere direction could present real problems for freight trains. Graded C+ “Needs further improvement” ?? I suspect that, without a significant extra land-take a “proper” rebuild is not possible. The Latchmere line has to go over Falcon Lane – but IF the Asda, signalling centre, Lidl & the PCSU building were to go, then you really could do something, with gently staggered platforms, maybe. 1) the scheme as far as the layout is concerned is very much operator driven and is so much better in many ways. I don’t think there will be much ground for criticism on that basis when the details emerge and are fully understood. 2) the scheme is being designed from the outset to go a long way to paying its way by involving developers and the council at a very early stage and the area is ripe for redevelopment. £ £ £ £ is indeed only a slight problem or maybe no problem at all depending on how things work out. 3) On the money side, the scheme developed as an alternative to one intended to improve passenger flow which turned out to be very expensive to achieve not very much. Don’t equate amount of money needed with the size of the prioject if there is a substantial 3rd party developer aspect. I don’t think you can take the track layout as definite – as I have already observed, it shows only three tracks on the SW main line towards Wimbledon which, even if Crossrail 2 takes some of the traffic, seems to be an economy too far. It is not easy to work out how the two extra platforms might be used – an arrangement like that at London Bridge (platforms 6-9) might be envisaged, where throughput is increased by having alternate trains call at opposite faces of the same platform. Or it could be to allow fast trains (Gat Ex?) to overtake trains calling at the station. Something similar already happens at Clapham Junction, where non-stoppers on the up fast whizz through platform 8, which has a reasonable curve and thus speed limit, whilst stopping trains are looped into Platform 7 (where the curve is sharper but the “Gap” is smaller). Whether it is the Brighton or the South Western which would get this treatment is unclear. As for the curvature issues, the plans show all the platforms as being straight – basically achieved by moving the whole station a couple of hundred yards further east. There was, I think, an alternative proposal to move the interchanges to a massively-extended Queenstown Road (on three levels to include the Brighton and Overground services), with only the local services retained at Clapham Junction, allowing demolition of most of the platforms, which would in turn allow the curves to be eased. Yes. That is the fundamental bit. Everything follows from that. Note that straight platforms mean reduced gaps which mean reduced boarding and alighting times and hence reduced dwell times. It also means that the time penalty for stopping in the station is reduced as acceleration and deceleration can be fast due to a lack of imposed speed restrictions (like as at Lewisham). Also note that this scheme is designed to be fundamentally integrated with Crossrail 2 although, as a precaution, it can also work if Crossrail 2 isn’t built. V Interesting & thanks for that. And that is the Plan. Operationally I’d give it an A but can’t say any more! Way better than commentators have got to so far. No over taking just more calling 100% off peak and peak flow direction, GatEx would call. The current P7/8 usage is a bit more complicated due to signalling overlap reasons so mixed mode with either 7 (stopping) and 8 (passing) can only be used shoulder and off peak when things are quieter. During the peak all have to run through P8 (at 40mph) to maximise capacity and avoid P7 (15mph limits for multiple reasons). I’d say the illustrative platform layout is very much a draft as far as the track is concerned. Adding another platform face for LO services would be fairly trivial considering the scope of the scheme which must involve reconstruction of the viaducts. On the SWM /SC side, one additional island might be desirable so both SWM and SC fasts could have 4 faces each, with slows for both routes and WLL each having a single island pair. An extra island might be added in the yard to the north of the SWM platforms but that would clearly reduce yard standage and complicate headshunt /reception and washer road access. A pair of platforms for each running line (fasts only in this case), arranged around a common island, with clear overlap approach when the preceding train is departing the parallel platform, is a very flexible and passenger-friendly configuration, and has been used for major reconstructions at Reading and London Bridge. It can allow for pragmatically long dwells at these major hubs for heavily loaded, full length trains in the peaks. The same concept is proposed for East Croydon. As to the raft development, it would be nice to have a few more voids through which fresh air and light might enter the track and platform level, but on the other hand at such a busy station, such openings, above the throats at either end for example, would only be a source of mainly noise pollution for the new urban realm above. ‘Underground’ stations don’t have to be oppressive environments if designed well, but I understand to some it might seem rather a paradox having a pseudo subterranean station complex perched on a viaduct at one end. I think the operational, train and passenger flow capacity and accessibility benefits would be worth the loss of the open air though. At least it means the platforms can be completely covered. The yard would be the easiest place to over-deck, clearly, as it’s much simpler taking out a siding or two at a time to construct a row of columns than a platform. Reconstruction of the station area is going to require a lot of very detailed stage planning work. The aim is to have large voids in the decking to avoid falling foul of underground station safety requirements. That’s seven islands in total – the plan only shows six. But some variant of “the Big Idea” in the article above might solve this – essentially diverting the down Brighton Slow from the London direction into what is currently Platform 17, and a connection from Platform 16 onto the up Brighton Slow towards London, freeing up the existing slow line platforms 14 and 15 for the down fast, and 12 and 13 for the up fast. This effectively replaces the flat junction between the Brighton slow lines and the West London Line, at the country end of the station, by a grade separated junction at the London end. Without going into any detail, a further big operational plus will be the ability to terminate trains at Clapham Junction at times of disruption. There is almost not much point in doing it now but if Crossrail 2 were up and running it would make a lot more sense as people could continue their onward journey. This is hardly a great reveal. It is the same with London Bridge which could probably function quite well as a temporary terminus. The Charing Cross side was put to the test soon after completion due to a gas leak in the Strand and came out of it quite well. Trains have often terminated at Clapham Junction for one reason or another. During the Victoria resignalling back in the 1970s(?) platforms 16 and 17 were used for that purpose. Trains on the Windsor side are also terminated there on some weekends when maintenance work closes some of the tracks towards Waterloo. There is at least one morning counter-peak scheduled service which starts there (0754 to Waterloo via Richmond, Kingston, and Clapham Junction again). Are you suggesting the new layout would make such reversals easier? 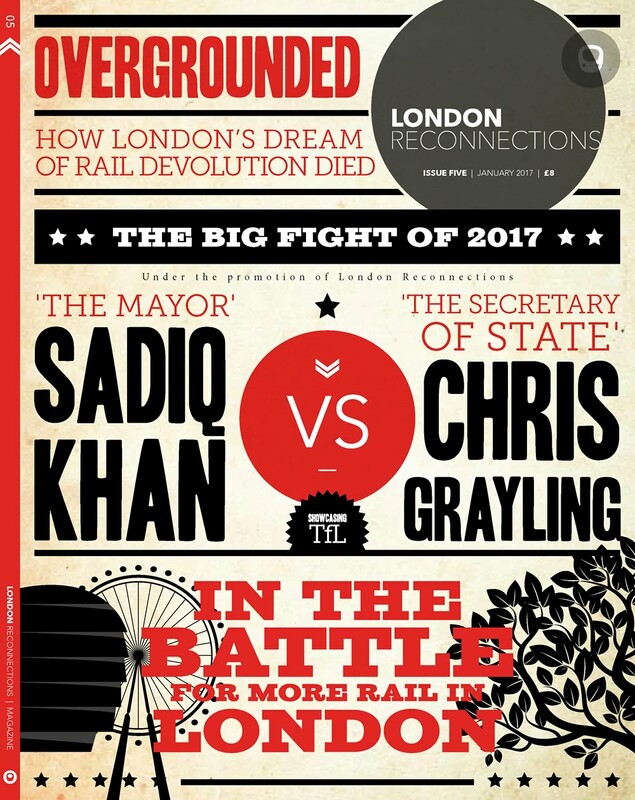 No mention of connecting the two halves of the orbital Overground in a major reconstruction? I am suggesting that, at times of disruption with no ability to continue to either Waterloo or Victoria or both you could run a half decent service into Clapham Junction – much better than you can today. Not stated but if Crossrail 2 was up and running you could probably get a full weekend possession of the tracks between Clapham Junction and Waterloo if needed. Why would you even want to? It would be an operating nightmare. It took them over a century to undo the damage of running the Circle line in a circle. If they, for some absolutely mad reason, wanted to do this, then surely they would do it at Highbury & Islington where it would be much easier? Anyway, the trains are currently only five cars long. If this was a good idea to join these routes they could simply reverse out of the dead-end platform after a short delay whilst the driver changes ends – as is done at quite a few places in the UK. They don’t – and there is a reason for this. @ Timbeau – I think any additional platforms would make reversals easier, assuming suitable additional fully signalled crossovers are provided for the movements. Multiple fast line platforms in particular could make turning back odd trains or a proportion of the service over a time period more practical as the trains that continue forward could overtake those reversing. I like your grade separation for the WLL junction from the SC slows but if that proved impossible, perhaps an extra middle ‘right turn lane’ platform for the up slow to WLL could be useful. That would push the down slow over to one additional side platform on the south side. @PoP – Is it not more likely that at least some LO services may be extended to other destinations in south and west London, via Streatham Hill or Croydon in the case of the WLL and via Wandsworth Town in the case of the SLL. Of the two unlikely scenarios, the one you suggest has more chance of happening. There have been TfL inspired scenarios like you suggest and absolutely nothing about joining up the two existing sections. Despite that, I would suggest that there is very little chance for many years to come. London Bridge actually has spare terminal capacity. Amongst other things, it is the inner-London flat junctions that are the bottleneck. So any spare capacity is best used with 10 or 12 car suburban trains not TfL tiddlers. I’m pleased to see that PoP and ngh are on the case, and that my initial misgivings about the scheme were based on a document which didn’t do full justice to the rail operational input which they have now explained. Can we expect a more detailed write-up of the scheme on LR in due course? In due course but there are details to be finalised and I suspect we are nowhere near the point where Network Rail is ready to go public on it. There are a lot of ducks to be put in a row before we get to that stage. According to Carto Metro, through working from the South to West London lines is possible by reversal in Platform 1, and in the opposite direction using either platform – it seems to be the preferred route for stock transfers, as the link at Highbury isn’t electrified. Anyway, would such a through service be significantly more useful than the current same-platform interchange? There can’t be that many people wishing to travel between e.g Peckham and Shepherds Bush, surely? It would also be possible to run direct from Wandsworth Road to Imperial Wharf (and there used to be a Parliamentary service which did just that), but only by missing out Clapham Junction. I seem to recall at one time there was a proposal for the Overground to run to Wimbledon instead of Clapham Junction, by turning left at Peckham Rye. One of the things that made the London Bridge works tolerable was that the service into it (on both sides) was pretty reliable. I note the comparisons with London Bridge, but isn’t Liverpool Street more comparable, with development over almost all the site? Certainly a good way to raise funds for a much needed project. As well as facilitating interchange, the development itself would generate a lot of traffic. Is there capacity for this if CR2 didn’t go ahead at the same time? No much more similar to London Bridge especially as regards construction and phasing. The original plan for London Bridge included over decking but the site is more complex than Clapham and it was abandoned to derisk the project. Liverpool Street / Broadgate redevelopment was modelled on that of Victoria (Central side)) of course . Reading the TfL proposal for metroisation of the inner southern lines, one of the proposed infrastructure requirements is the grade separation of Falcon Junction. Which, unless there is another one, is just south of Clapham Junction, in a very constrained location. Any idea how this could be achieved? Thanks. And oops, feel a bit of an idiot for not checking the actual article. The “Big Idea” in the original article sounds like it solves the same problem that grade separation would, but I don’t see how one could accurately describe the “Big Idea” as a grade separation of Falcon Junction? It leaves Falcon junction as a flat junction, even if it removes conflicting movements. If the developers are suggesting grade separation of Falcon Junction, then I suspect they have a plan which differs in some notable way from the plan postulated in the article, and I’d be interested to know what’s actually being proposed. Indeed, the Big Idea is more than just moving the points at Falcon Junction (in the Down direction only) a couple of hundred yards east! It makes use of the thereby-freed-up Platform 15 to provide extra dwell time capacity in the peak direction.